Samara Beach is a beautiful white sand beach located in Guanacaste, in the North of Costa Rica. Samara beach forms a large half moon bay which is shaded by palms and old fig trees. It is famous for its safe and shallow waters, and ideal for swimming and safe for kids. In the bay of Samara, travelers will see Isla Chora, a small island with its own coral reef and primary forest. It is popular for excursions during the day and visitors can find a variety of exotic plants and animals along the beach. 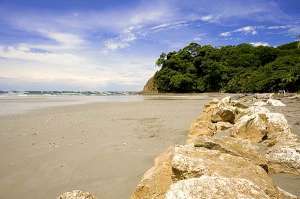 The town of Samara was one of the first beach communities of Costa Rica and has remained a small and peaceful destination. It is easily reachable from all parts of Costa Rica. Among a wide variety of hotels, you will also find supermarkets, restaurants, bars, souvenir shops and a bank. Samara also offers some water sports and other activities such as horseback riding, paragliding, waterfall visits and canopy tours. The submarine adventure is very exciting; if you go diving or snorkeling at the offshore coral reef, you can find schools of yellow jacks, sardines and manta rays, observe the dolphins, and the nesting of Sea Turtles. Samara and its general area offer a lot of attractions and activities that combines nature and adventure.